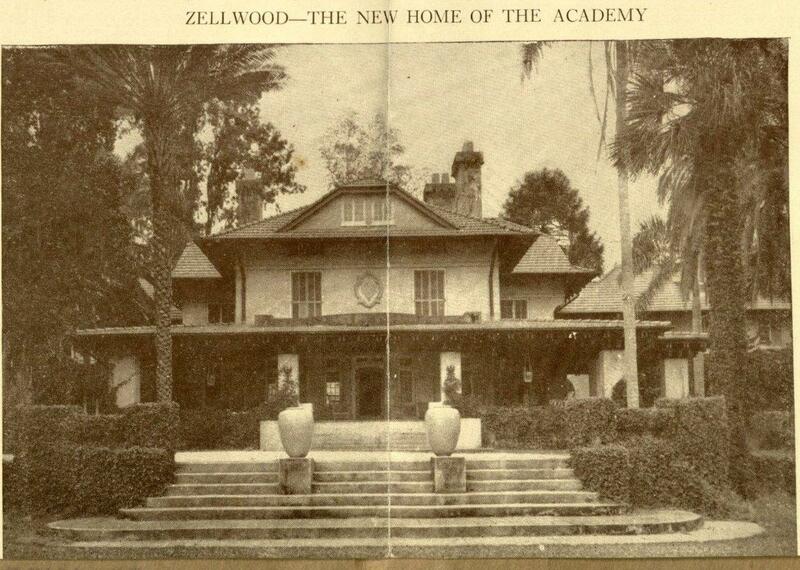 The Hampden-DuBose Academy, well known local interdenominational school for the children of missionaries, has purchased the famed Laughlin Estate near Zellwood which it will use as the new academy site starting about March 15. The consideration in the purchase was believed to be approximately $50,000, and was purchased from S.W. and Eugene Speer who had formerly purchased the estate from the Laughlin estate. The purchase included approximately five acres of grove, more than 100 acres of land, and 21 buildings. The Laughlin estate has been known for some years as one of Florida’s most beautiful estates. More than 80 students and 11 faculty members of the academy will move into the new school site about March 15. Dr. P. W. DuBose, president of the academy, announced. The estate is located on a lake and is filled with giant pines, oaks, azaleas, flowering shrubs and plants that have made it recognized as one of Florida’s most beautiful sites. Dr. DuBose said that Moody Manor, located in the old Beeman home on Gore Ave., will continue to be maintained as a Bible center in Orlando, as well as to provide a Victory Bible Club for servicemen in this area every Friday night. The Rev. P. W. DuBose, who operates the unique Hampden DuBose school for children of Christian missionaries, in buying the Laughlin estate at Zellwood for $50,000, makes one of the biggest real estate deals of the new year. It hasn’t been so many years back that Dr. DuBose told us he had no particular capital, nor specific backing. “Whenever we need money, it turns up” is the way he explained it. We learned later that people all over the world –people in all walks of life, people of all religious faiths and people of all colors– hear of his academy and his work among the missionaries’ children and send him money. We would not be surprised to learn that some affluent benefactor has purchased this estate and made the academy a present of it outright. Memoirs of a Pioneer by W. R. O’Neal published 28 February 1943. The passing of the Laughlin Estate at Zellwood on the banks of Lake Maggiore to the Dubose Academy marks the passing from private ownership of the largest and most outstanding estate in Orange County. James Laughlin Jr., one of the Jones and Laughlin firm of iron masters of Pittsburgh came to Florida to make a home in a subtropical climate. All that the owner, architect, builder, decorator, landscape gardener, engineer or gardener could do to make a home without regard to expense was done. His dairy herds, poultry farms, were the finest in South Florida, the equal of any anywhere. The home, famous for its hospitality during the Winter season was always filled with guests to capacity. Localities change as to people. It is within the memory of the writer when the residents of Zellwood were men and women of national and international reputation. Col. T. Elwood Zell, a Philadelphia publisher and author of Zell’s Cyclopedia came in 1875. Col. George Foot and Capt. D. A. Irwin, U.S. Army retired; Davenport of Kansas City, whose daughter was an artist of distinction; Col. R. G. Robinson, the first postmaster of Zellwood; Hugart, president of Grand Rapids and Indiana R. R.; J. O. Loraine of Philadelphia; J. W. Paul and Charles H. Baker of Pittsburgh; Dr. Tessen, who was with Reno in the Custer massacre; all forming a community not only of wealth but wide contract with the world. The venture of Lemuel H. Davis of Philadelphia to drain the low lands of Lake Apopka; the establishment of a community of Hollanders to cultivate the land; the mining of Kaolin; the development of John T. Pirie of Carson Pirie & Scott, merchants of Chicago, all brought a development and romance that few locations have ever enjoyed. The passing of all these splendid people brings a note of sadness. Life has its compensations. 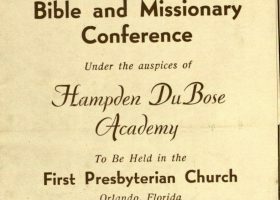 Students in the Dubose Academy coming from homes of missionaries from all parts of the world, many of them distant lands, will have the opportunity to know that delightful surroundings will to in South Florida. From the Laughlin home will the young men go out into the great outside world to carry the message of Florida. 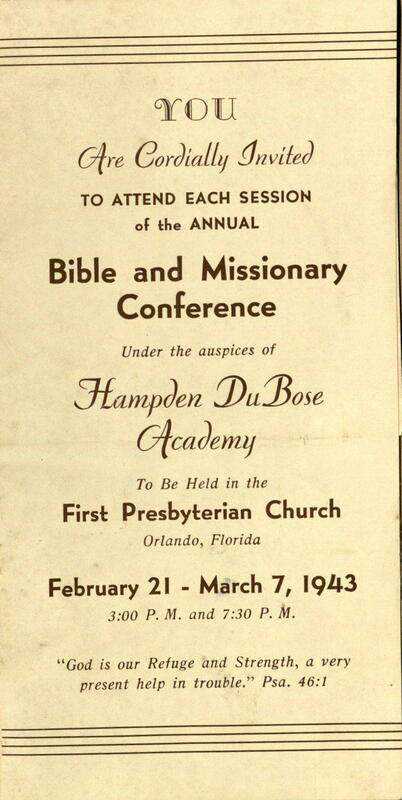 Invitation to the Annual Bible and Missionary Conference under the auspices of Hampden DuBose Academy to be held in the First Presbyterian Church, Orlando, Florida, February 21 - March 7, 1943. 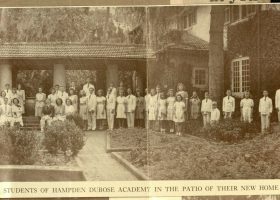 Brochure includes several photographs of the new location of the Hampden DuBose Academy in the former Laughlin home in Zellwood, Florida and a photograph of the students.